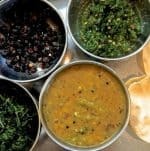 Ven Pongal is the South Indian breakfast version of khichidi and is made of moong dhal (green gram lentils) and rice, pressure cooked and tempered with cumin, coriander leaves, pepper and ghee. 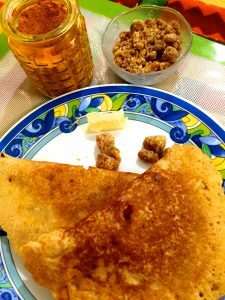 It is a popular breakfast, served with chutney and sambar and also along with dal vada or vadai, made from deep fried lentil batter. 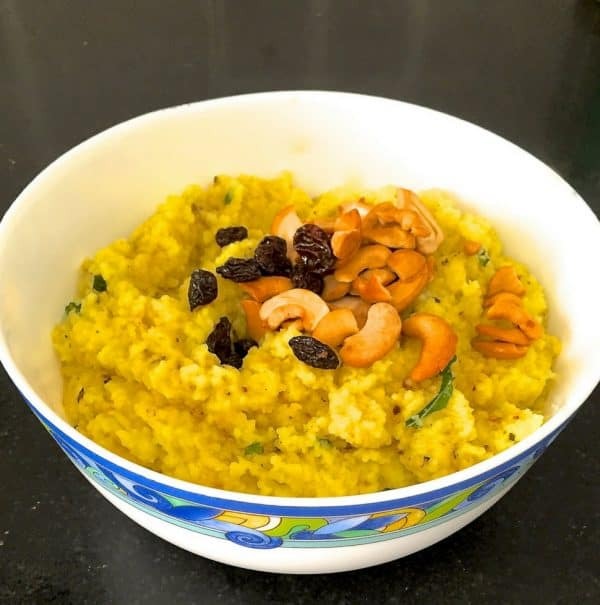 Ven Pongal is easy to make and is both nutritious and tasty, specially when it is tempered with ghee, garnished with fried cashew and served really hot. Surprisingly, one of the best Pongals that I have had has been at Bangalore Airport. 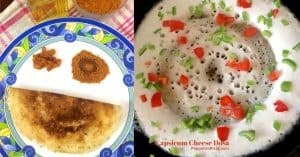 Whether it was the hunger pangs before boarding an early morning flight, or the fact of the Pongal being served hot with a tasty chutney, the aroma and consistency made for a flavourful breakfast. Even better was the hot Ven Pongal prasadam at the Kapaleeswarar Temple at Mylapore, at Chennai (Madras as it was once known). As school girls, my cousins Ramaa, Kamini and I would conscientiously participate in the bhajan processions every morning during the Tamil month of Margazhi, even though it meant waking up at 4.30 on a chill misty morning, having a bath and joining the processing to sing bhajans while walking around the 4 long streets bordering the temple. The procession culminated at the Temple itself and we would be the first to receive the hot and very tasty Ven Pongal with the ghee floating amidst the round peppercorns in the dhonai (leaf cup) full of pongal. 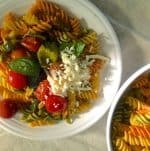 We would attack this tasty food, complacent and feeling rather virtuous as we would not have had coffee in the morning and had broken our fast only with the prasadam. I was not very good at making Ven Pongal when I first tried it out. It would turn out lumpy and not very attractive. Compounded with the fact that one had to make sambar along with the pongal, I was not too keen on it as a breakfast item. Pramod was very fond of the pongal and would order it whenever he went to a Restauraunt serving Tamil cuisine, as he liked the taste of the sambar there. 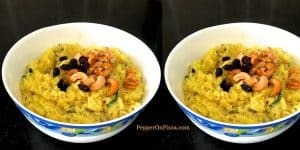 When I started this blog and got back to cooking in real earnest, I did make Ven Pongal again after many years – and now the pongal gets made as it should, with right consistency, full of flavour and the goodness of the ghee and cashew nuts. I have finally learnt to make an authentic Ven Pongal! 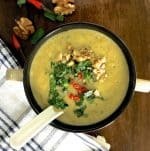 Ven Pongal, a delicious South Indian breakfast version of khichidi, made of moong dhal (green gram lentils) and rice, pressure cooked and tempered with cumin and pepper in ghee, garnished with coriander leaves and fried cashew nuts. 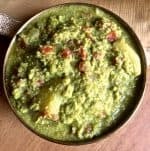 Roast the moong dal (green gram) in a tsp of ghee so that it darkens and you get the aroma of the dal and ghee (about a minute). It can easily catch at the bottom of the pan and burn, so keep stirring gently. Transfer the dal into a bowl and keep aside. Rinse the rice 3-4 times till the water looks clear, add the dal and the water, salt and turmeric. Just a pinch of turmeric should do. Pressure cook for 2 whistles. You want the pongal just soft, not mushy. Turn off the heat and let the cooker release pressure on its own. Halve the cashewnuts. Chop the curry leaves, chilli and ginger and coarsely grind the peppercorns. Reserve 2-3 peppercorns for the garnish. Once the cooker is ready to be opened, heat half the ghee in a frying pan on a low flame. Fry the cashew nut halves till golden ( they always say this in recipes, but somehow mine turn a pinkish beige and then quickly get to a dark brown tinge 😒) remove the cashew from the pan and set aside. 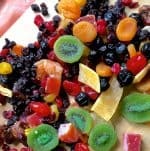 Continuing with a low flame, fry the raisins in the remaining ghee for 10 secs and remove from the pan when they puff up. To the ghee left over in the pan add jeera/ cumin seeds and sauté for 10 secs. Add the pieces of chilli and let them scald all over. Add ginger, sauté, add curry leaves and when the sputtering is done, add the ground pepper. Open the pressure cooker and stir the rice dal mixture just once so that it combines well without getting mushy. Temper with the fried jeera ginger pepper mixture along with the ghee it was fried in.